We’re glad you’re taken that first step towards achieving excellent oral health. It’s our desire that you make Smiles in Currambine your permanent dental home. Our dentists make every effort to accommodate the scheduling needs of your family. From offering evening hours to weekend appointment times, we’re sure to have something that works for your busy routine. If you’re in pain, please call us right away. All emergency patients receive the upmost priority in regard to scheduling availability. Please reserve approximately 50 minutes for your first visit with us. During this consultation, we will discuss any concerns that you have and explain appropriate treatment recommendations. Rest assured, we will not begin any procedures until we have fully discussed your care plan with you. Updated X-rays are recommended every two years. If you have current records or X-rays from a previous provider, please bring a copy with you. Should you require a scale and clean, we can arrange to have you booked in on the same day, or schedule it at another time. Gift yourself or your friend or family member a whiter brighter smile at Smiles in Currambine. Special offer – Teeth whitening* $699, terms and conditions apply*. Teeth whitening may not be suitable for all candidates. Treatment will be provided post examination to ensure you are dentally fit. If there is active decay, this would need to be addressed first. Teeth whitening special offer is for a limited time only. Offer includes in chair professional teeth whitening treatment and take home kit! If you have any anxiety regarding your care, we are pleased to provide a number of sedation dentistry services to put your mind at ease. 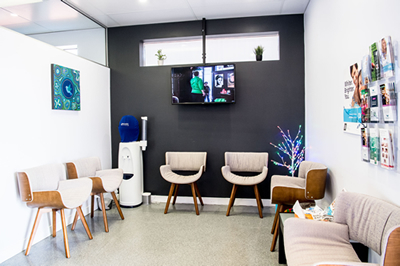 Our Currambine dentists believe that through adequate education and a gentle chairside manner, we can help even the most anxious of patients overcome their dental phobia.